The Medallion Quilt chapter details strategies for laying out and constructing medallion quilts where each border builds upon the last. There are some pre-fab layouts for this style in the Layout Library. The Layout Library was a new find for me. Medallions seem like a great segue from samplers! I’d love to design a quilt in this style…. I have been designing with EQ7 since 2010, and upgraded to EQ8 when it came out last year. I thought I was pretty versed in designing using the software. That is until I had the chance to sit down and review this book. What I found was, that although I am confident in how to design quilts using EQ8, there are SO MANY features that I have never utilized. Of special interest to me are the sections on modern layouts. EQ8 includes irregular grids in the Layout Library - which can serve as starting points in design. My Setting Pattern is very similar to this example from the book in the Alternate Gridwork section. It was interesting to see how this quilt was constructed because I designed mine in the traditional horizontal grid layout instead of this strip layout. The Alternate Grillwork chapter outlines several layout method to utilize when building non-conventional designs. Reading these lessons, that we are led through step-by-step, on various techniques opens up a whole new world of design in EQ8 (for me at least). Even if you are proficient in using EQ, I think you’d be interested in seeing how others approach design. You know that’s the one thing I love best about quilting. We are absolutely never done learning. Learning keeps the brain healthy! This quilt shows me simply playing with color gradation in one of the Irregular Grids from the Layout Library. I kind of like the simplicity of using the colors with squares and rectangles. Super basic… but playing with appliqué was new and fun for me. I scanned and imported the drawing of the little bird I had done on the left, created it as an appliqué block, and was able to print templates for the appliqué after sketching. The pic on the right shows what the quilt block would look like colored with fabric. What a fun exercise! 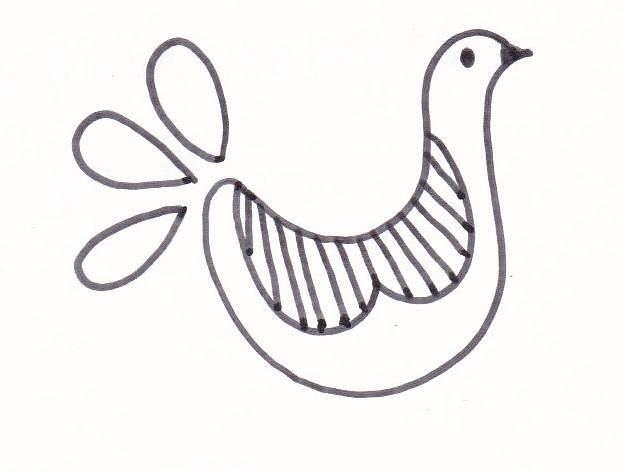 What if I made a string block and then cut out the striped appliqué piece on the bird’s back…. hmmmm….. lots of new ideas brewing here! I’m giving away one copy of the EQ8 Designing More Quilts book here on the blog. If you would like a chance to win, leave a comment below telling me which of the topics/chapters listed above interests you most. (Giveaway ends Monday, October 8, 2018 at 11:59pm. US + Canada residents only). Use the code EQ8CHANY to save 20% off any product, including EQ8. Visit EQ here.